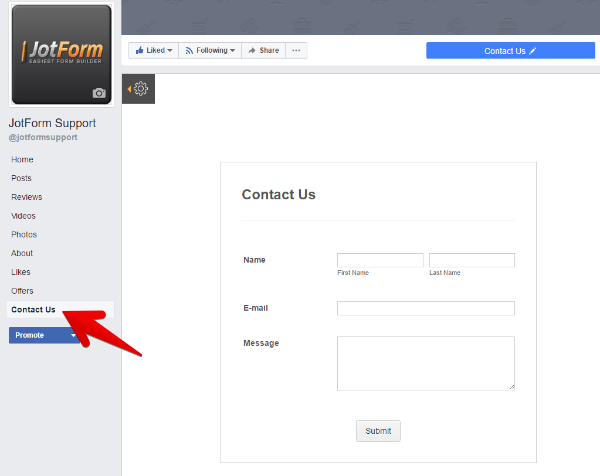 Adding a contact form to your Facebook page is quick and easy with JotForm. NOTE: Before you start, make sure your Facebook Page has at least 2000 fans. According to Facebook, "The Page Tabs feature is only available to Pages with 2000 or more fans, or Pages managed by whitelisted apps." Sign up for JotForm so you can add forms to your Facebook Page. 1. Click Publish in the top menu. 2. Click Platforms in the left menu. 4. 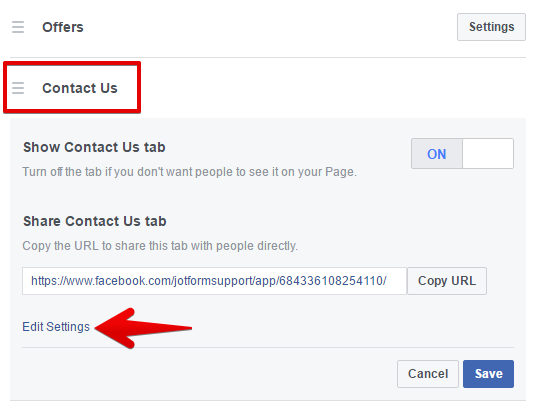 After clicking Facebook, click the Add JotForm Tab button. 5. 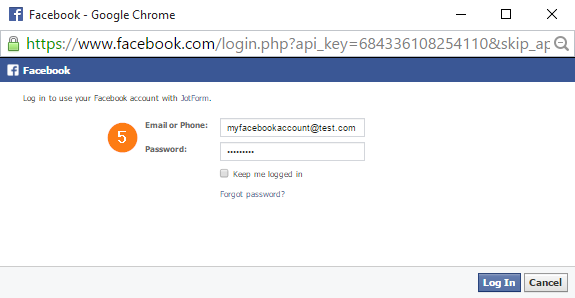 A popup window will appear and ask you to log into your Facebook account. 6. After logging into Facebook, the Add Page Tab window will appear, and you will have the option to choose the Facebook Page you would like your form to be added to. On the screencast below, the Facebook account has only one Page, named Sample Company. After selecting the Page, click the Add Page Tab button. 7. After successfully adding your form to your Facebook Page, the Go to Your Page link will appear. Click the link to go to your Facebook Page. 8. On your Facebook Page, you'll see a Contact Us tab. Click it to view your form. a. On your Facebook Page, click Settings in the upper right corner. b. Click Edit Page in the left menu. c. Click Settings on the Contact Us tab, and then click Edit Settings. d. Afterward, type in your Custom Tab Name. You can also change the Custom Tab Image. If you want to change the form, you can do so right on the tab/app page. If you are logged into your account, you should see a gear (settings) icon on the left. 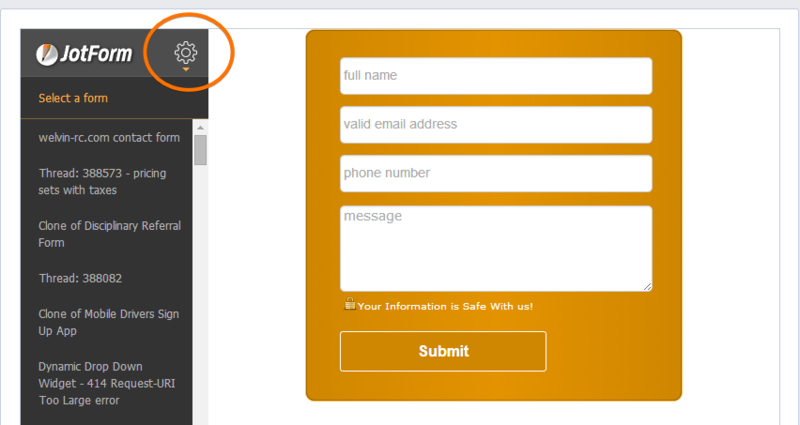 Just click it and select a form from the list. IMPORTANT: Facebook Tabs won't work on mobile. Facebook hasn't deployed this functionality yet. It should work as intended if you view it on a desktop. There's a discussion on this page that will further explain Facebook's stand on this. This post came straight from the Facebook team, courtesy of a developer support engineer. I am getting this error after step #6: This page does not have permission to install the custom tab. I can't log in my account is +8801988150480. Additional:(that's my personal Facebook Account. I can't log into my account. It gives me lots of hurt. Please response me as early as possible. Here is my govt. issued photo id. Please give my id back. is my real account. If you are confused please check out my government id and back to my account as soon as possible. Thank you.). # How is it solution? Hi, When we set up the form on our facebook page, where do the submissions go? How do I find them all at the end of the competition? Thanks! Is there anyway to share of embed the code into facebook directly to get around this 2000 limitation? I'm a small non-profit and one of the reasons we purchased was the ability to post to Facebook. What if i want to add two forms on a single page? I followed these instructions and am still getting an error message stating that This page does not have permission to install tab. Has anyone found a solution? Hi, what is a whitelisted app? Any examples? help pls, i tried this but it says This page does not have permission to install the custom tab. There isn't 2,000 possible customers in my entire operating region, it is unreasonable to expect me to have 2000 users before the tab will install. I just wasted 2 hours due to this site's neglect in providing that information in the beginning. This is small town U.S.A., Not some big metropolitan city. What a waste. I too am getting the "This page does not have permission to install the custom tab" error. If this issue was known to JotForm then it would perhaps have been a good idea to state somewhere that unless you have 2000 likes on your Facebook page you won't be able to add the form to it rather than letting people waste time making the form only for it to not work. "This page does not have permission to install the custom tab"
This is confusing because I have embedded a jotform on another Facebook page with no issue. Facebook's instructions see incomplete and did not correct the issues either. Do you know how to correct this issue? is there a way to remove the gear so people can only use the form that I put on there? I am trying to use my form in a FB ad. I was able to do it a few years ago, but now when I create an ad in FB it only seems to offer me to build a form in FB or choose among the forms previously created in FB. Is there a way to link my Jot form which I already added as a tab? Does FB no longer allows third party forms? Kindly tell if there is any option to create a query form button on facebook. I tried to add 3 forms on my facebook page but it is not allowing me. Can i add 3 forms into 1 tab on Facebook or we are allowed to add only 1 form per page? Información de mucha utilidad, muy buena!! I followed all these steps one by one and it says it's been added successfully but nothing shows up. Please advise. is this app be showed on mobiles (ios , android ) ? Hello, Can we add more than one form on facebook? how? Tjank you . i am having a hard to try submiting the form i made, is there any one who knows how to submit the form after the client for example has filled out the form we made? It's says added successfully but i cannot see it on my facebook page. I am having the same issue as IBCBoilingbrook. I followed the steps and supposedly added the app to my page but I cannot find the app anywhere in my account. When I try to view the answer on the above thread, it doesn't load. Can you please advise what the issue may be? All of the Facebook Pages that you are an admin of have already had this App Tab installed. But when i log into my facebook page, and try to perform steps 5 and 6, I cannot see the jotform app anywhere and on my Facebook account, when i go to "Partner Apps and Services, it says "You haven't added any services to your Page yet." Can this registration be added to an event on my facebook page? I don't have anything under "services" for "apps", just "partner apps and services" and it's empty. When I went back to see if I missed a step, it no longer shows the page I added it to leading me to believe that's because I've already added it. I just don't know where to find the app on Facebook since it's not under "partner apps and services". Does that make sense? Once I go into Facebook, under apps and services, the jot form app isn't there. What did I miss? The add form to your Facebook page button is not working. Nothing happens at all when I click on it. I'm an admin for a club page but Jotform doesn't give me the choice of adding a tab to the club page.